MAX™ CAT Products are made with select ingredients and the vitamins and minerals your cat needs for its health and wellness. 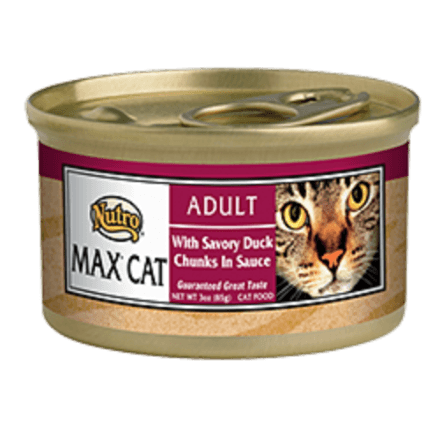 With the taste of real duck, your cat will find MAX™ CAT Products irresistible! MAX™ CAT Products provide rich sources of Omega-6 and Omega-3 fatty acids to help provide for a rich, glossy coat and supple skin. Chicken Broth, Chicken, Chicken Liver, Beef Liver, Potato Starch, Duck, Wheat Gluten, Pork Plasma, Salt, Natural Flavours,Guar Gum, Sodium Phosphate, Calcium Carbonate, Potassium Chloride, DL-Methionine, Taurine, Xanthan Gum, Ferrous Sulfate, Vitamin E Supplement, Choline Chloride, Zinc Oxide, Thiamine Mononitrate (Vitamin B1), Copper Proteinate, Manganous Sulfate, Niacin, d-Calcium Pantothenate, Vitamin A Supplement, Vitamin D3 Supplement, Pyridoxine Hydrochloride, Riboflavin Supplement, Potassium Iodide, Vitamin B12 Supplement, Sodium Selenite, Folic Acid, Biotin. NUTRO™ MAX™ CAT With Savoury Duck Chunks in Sauce Wet Cat Food is formulated to meet the nutritional levels established by the AAFCO Cat Food Nutrient Profiles for adult maintenance.